What is your পছন্দ song ? does any one know japanese here?? if so, can আপনি translate the চলচ্ছবি for us like nico nico অথবা the band মতামত on their songs ?? অথবা please if আপনি find চলচ্ছবি subded share it with us !!! 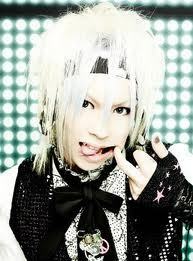 Ko-ki (born May 1st, 1990; Japan) is a Japanese artist member of the জনপ্রিয় JRock band ViViD. He is the band's ঢাকি and DJ. IV (イヴ) (born February 16th, 1990; Japan) is a Japanese artist member of the জনপ্রিয় JRock band ViViD. He is the band's bassist and the composer of most of their songs. If ko-ki could switch roles with another band member for a দিন he would play .,?